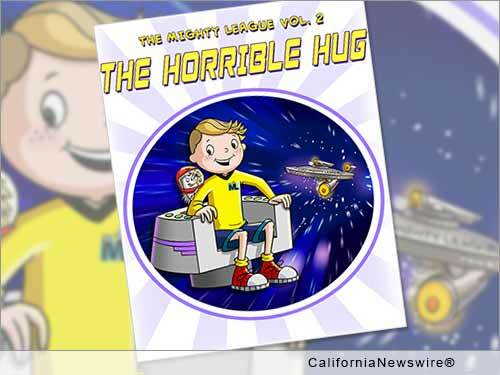 SAN FRANCISCO, Calif. /California Newswire/ — Geek Club Books, Inc., an autism nonprofit, today announced the release of their interactive digital comic book, "The Mighty League, Vol. 2: The Horrible Hug." This is the second in their digital and app autistic hero comic series created to help children understand their autistic peers and end the stigma of autism. The comic is downloadable via the Geek Club Books website. The digital comic addresses the fear and anxiety of going to school, making friends and feeling acceptance for being different. "We turned a story of going to a new school into a space adventure," said the organization's spokesperson and President, Jodi Murphy. "On the journey, our autistic star ship captain eventually lowers his shields and engages after learning the welcoming signs of friendship and acceptance." The curriculum for "Horrible Hug" helps educators, teachers, students who are not on the autism spectrum and autistic students have a better understanding of the characteristics of autism and Asperger's Syndrome. "It helps to dispel the false assumptions often made by the general education population that 'different' means 'difficult' or disabled," said Jayne Clare, "Horrible Hug" curriculum developer and special education consultant. Both digital comic and curriculum help all children become more aware of their social and emotional health as well as those around them, learn appropriate social skills, and give students a "why they are important" overview. Access to Geek Club Books' Autistic Hero Comic can be found at http://geekclubbooks.com/mighty-league-2-ebook/. Founded by Jodi Murphy in 2014, Geek Club Books, is a 501c3 autism charity with an autism education and empowerment mission. They produce interactive children's story apps, enhanced e-books, curriculum, digital media and webisodes to change perceptions and end stigmas surrounding autism. The nonprofit partners with clinical advisors and educational specialists. A team of autistic adults collaborate and contribute their talents to everything the organization produces. Information: http://geekclubbooks.com/ and https://www.facebook.com/GeekClubBooks. Jayne Clare is a a thirty-year veteran teacher in special education, has been a leader in introducing educational technology into the classroom. She is co-founder of Teachers With Apps, an NSBA "20 to Watch" Leader Advancing Education Technology, contributor to George Lucas' Edutopia, and weekly host of EdAppTalk, an open table Facebook Group. Information: http://www.jayneclareconsulting.com/.